← Telling Stories, Saving Lives! 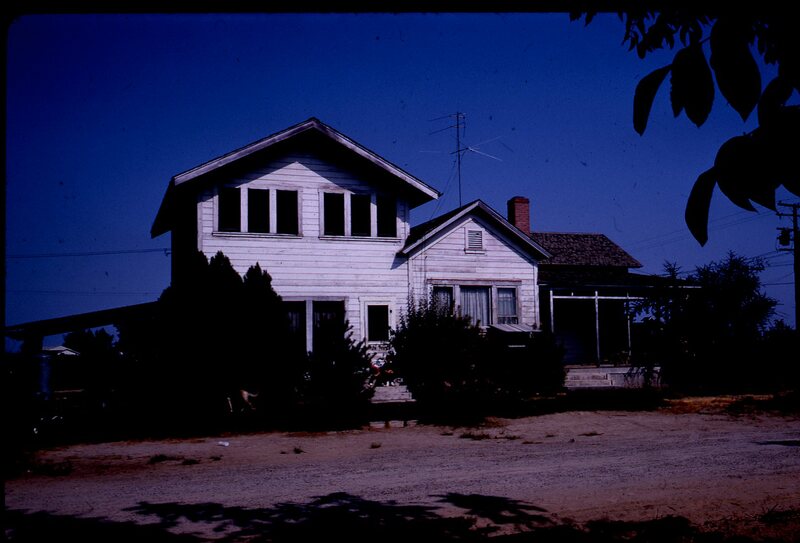 I grew up in an old farm house on Road 52 in Reedley, California. My parents bought the house in 1956 after they returned from living in Hagerstown, Maryland where my Dad completed 2 years of voluntary service for the Mennonite Church after they were married. Dad was a conscious objector during the war. That was his way of fulfilling his duty to the government. When the time came to return home, they purchased the farm next door to my Grandparents’ home where my Dad grew up, and they went to work farming. The house was old. It was full of dirt and dust that gave my Mom asthma. There were screens on the windows to keep flies and mosquitoes out. But not dirt and dust. In the photo above, Paul and I are sitting on the front steps, King and Queen of our roost. The entire farm was our playground. Below is Eric on his bike in the back yard. My mom was a city girl from Los Angeles County. I think life on the farm was hard for her. There was lots of dirt and there was no air conditioning. The San Joaquin Valley is blazing hot in the summertime. She was probably used to a different sort of living condition than the rest of us who only knew and loved the farm. Paul was born in 1957 and I followed 15 months later in 1959. Eric was born in 1962. We were little farm kids who knew every corner of the 40 acres we lived on. We built forts and dug tunnels and swam in ditches. We created cities for Matchbox cars in the dirt under the walnut trees and we cooled our feet in irrigation water. Life was grand and glorious. Our world was large. Mom was tired. Her world was much smaller than ours. 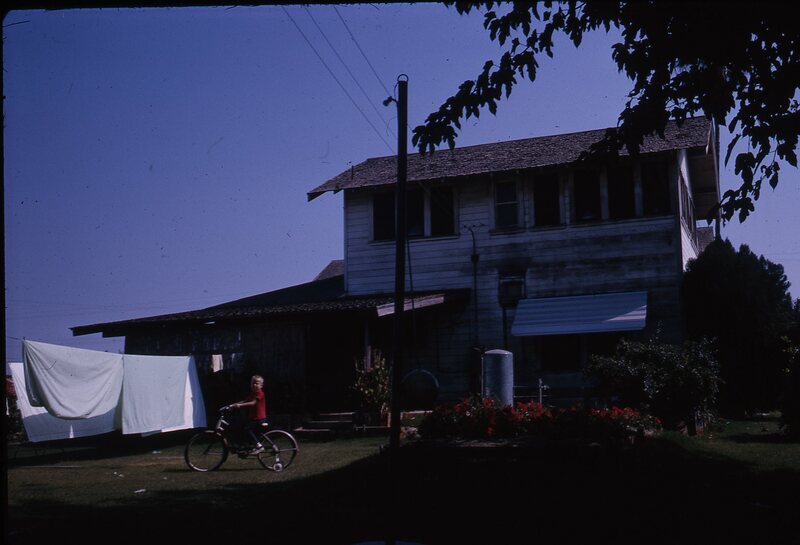 She had the house, the yard, the garden, cooking and cleaning, diapers and hanging laundry out to dry. I have memories of her on the gray sofa with her legs up, resting. It must have been a real chore to keep us and that house clean and looking nice. 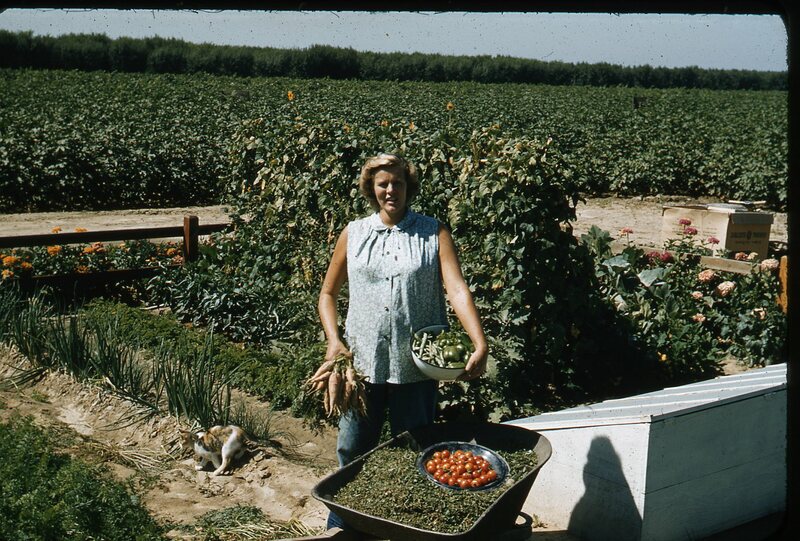 Below is Mom in the garden, pregnant with Paul in 1957. As we got older, Mom figured out ways to get us to help with the housework. I will never forget how she taught us the “Picky Fingers” game. We each selected our favorite Matchbox truck, get on our hands and knees and went to different places on the floor. When she said “go” we raced to use our “picky fingers” to pick up any little pieces of dirt or lint on the carpet. The first of us to fill our little dump truck or pick-up truck was the winner. Sometimes the job took more than one load from each of us. Mom was pretty ingenious. She’d watch from the sofa as we “vacuumed” the thread-bare carpets around the mis-matched furniture. I wonder if we even owned a vacuum. I remember this fun game was repeated often and we never tired of it. It was a game to us, competitive and fun. I’m wondering how long it will be before I have grandchildren. I know a really fun little game I’d like to teach them!